We all love drinking our BC wines. Although we do have a hotter climate in the South Okanagan, we still are overall a fairly cool climate region, doing well with aromatic white varieties, along with Pinot Noir and Gamay, as you move north or along the coast. Our mountainous interior limits the extent of our vineyards but if you cross the border into Washington and Oregon, you, in general, get a warmer climate and more open land areas, which gives vintners more opportunities to produce big red wines made from Cabernet Sauvignon, Merlot, and Syrah. Have you had a chance to enjoy the wines from our neighbours in Washington and Oregon? You can find some of their wines in our liquor stores, but there are many more you can enjoy and wineries you can visit with a relatively short drive across the border. As part of the upcoming EAT! Vancouver festival in Vancouver on November 9, 2018, some Washington, and Oregon, wineries will be pouring their wines for you to enjoy. But what kinds of wines do these states produce? Do they have any signature red and white grapes? Which wineries will be attending? That is what I’m here to tell you in the rest of this article. The Washington state 2018 harvest has begun and likely will finish sometime in October. There are predictions of a record grape harvest this year. Last year Washington state produced 229,000 tons of grapes for wine while 32,700 tons were grown in BC. That is quite a difference in volume. In Washington, about 64% of their grapes grown are for red wine. 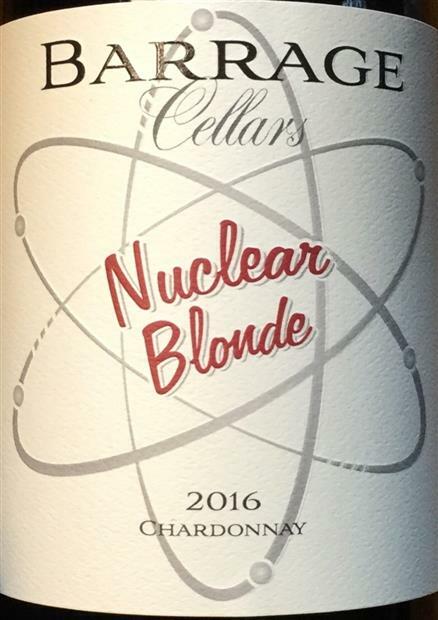 Along with the greater volume of grapes, there are 940+ wineries in Washington state, so you can be assured that there will be a winery that makes a wine that matches your taste. Most people do not know that Washington state is the second largest wine producer in the United States, after California; and Ste. Michelle Wine Estates, typically handles two-thirds of the state’s wine grape harvest. Ste. Michelle Wine Estates may be best known for their Riesling wines, and their joint venture with Dr. Ernst Loosen from Germany. Have you heard of their Eroica Rieslings? Each AVA has a unique character and can be known for growing a particular red or white grape quite well. 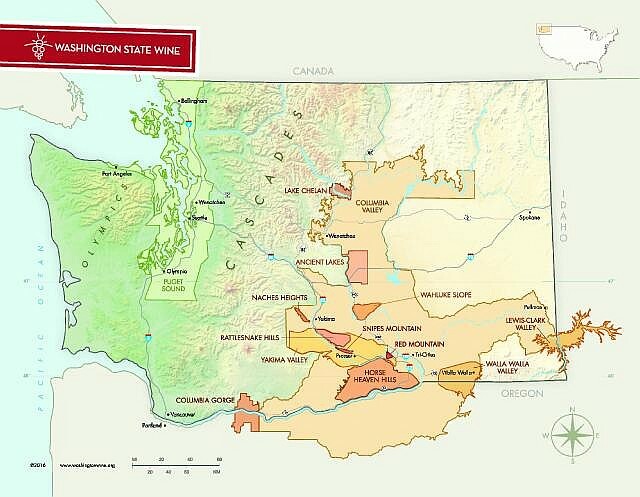 This may be too much detail to start your exploration of Washington state wines, so one way to simplify these AVAs is to think of two basic regions. A cooler, coastal region west of the Cascade Mountains, and a warmer, drier interior region east of the Cascade Mountains. The majority of the wineries are located east of the Cascade Mountains, and being a hotter, drier area, more red wines are produced. Which grape varieties can you find in Washington? The top three white varieties grown are Chardonnay, Riesling, and Sauvignon Blanc, in order of volume, while the top three red varieties are Cabernet Sauvignon, Merlot, and Syrah, again in order of volume. As mentioned, red wine production is larger than white wine, with 7,498 hectares of Cabernet Sauvignon grown compared to 2,996 hectares of Chardonnay according to Washington State Wine. I really enjoy Riesling and Syrah from Washington state. The Red Mountain AVA, in my opinion, produces fantastic Syrah and Cabernet Sauvignon wines. If you have time to travel to Washington state to try some wines, there are many wineries around Walla Walla, and tasting rooms in Walla Walla. From Vancouver, it is a good one day drive there so plan to spend a few days. If you only have two days, you can drive to Woodinville along the coast. There are a plethora of tasting rooms located close together. Make sure you have a designated driver if you want to visit several in a day. woodinvillewinecountry.com has a downloadable map you can print and take with you. Oregon is the state directly to the south of Washington. Being further south, you may think that they would have a warmer climate so should be producing bigger red wines, but that is not necessarily the case. Many wineries in Oregon are located close to the coast, in the Willamette Valley, giving the vineyards a cooler climate, which is better for more aromatic white varieties and Pinot Noir. And indeed Oregon is best known for their Pinot Noir and Pinot Gris wines, but also is gaining recognition for their Riesling wines. 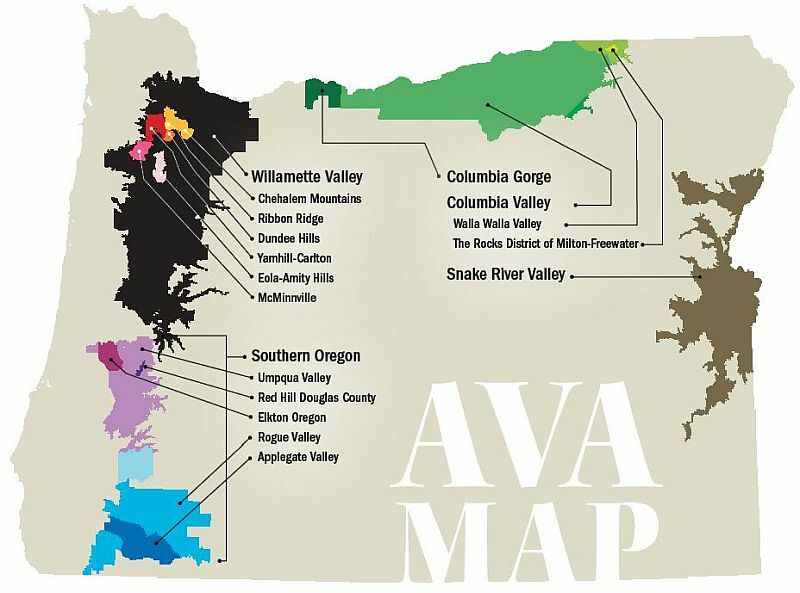 Oregon has 18 AVAs, starting in 1983 with the Willamette Valley AVA and the latest in 2015 called The Rocks District of Milton-Freewater. 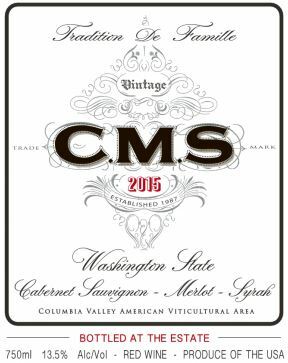 You may notice in the Oregon AVA map that the Columbia Gorge and Columbia Valley regions on the north end of Oregon coincide with the Columbia Gorge and Valley and the Walla Walla AVAs of Washington state. The width of the Columbia Gorge and Valley AVAs stretch from warmer, desert conditions in the east, and cooler, wetter conditions in the west, which allows these AVAs to grow Riesling, Chardonnay, Pinot Noir, Cabernet Sauvignon, Merlot, Syrah, Sauvignon Blanc, Pinot Gris, Gewürztraminer, Cabernet Franc, and Viognier. If you are a Pinot Noir lover, then you should be trying the wines from the Willamette Valley AVA. That is this region’s signature grape. There are over 15,000 acres of Pinot Noir planted here. The other cooler climate grapes that grow in this region are Pinot Gris, Chardonnay, Riesling, and Pinot Blanc. Pinot Gris is the second most planted grape in this AVA yet only 3,000 acres are planted. Wine Spectator has recently called the Willamette Valley a “happening place”, and recommends the 2016 vintage of Pinot Noirs. A trip to Oregon to taste their wine is a long drive from Vancouver so plan on a few days once you are there. Many people stay along the coast and visit McMinnville and their tasting rooms. The map below will give you an idea of the wineries in and around McMinnville. Have you noticed that the Oregon wines listed are more white aromatics and Pinot Noir, while the Washington wines have a lot of Cabernet Sauvignon, Merlot, and Syrah? I hope I have sparked your interest in Washington and Oregon state wines. Buy a ticket to EAT! Vancouver to try out some wines of Washington and Oregon. Thanks to the USDA, Foreign Agricultural Service for helping fund this article.